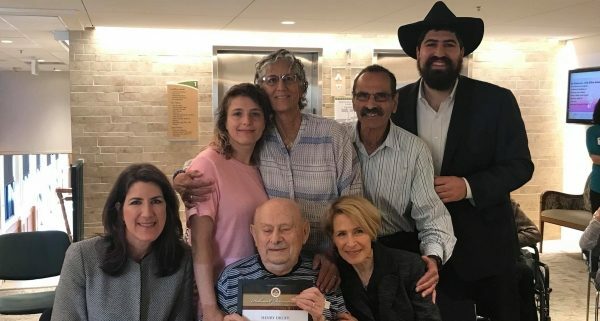 94-year-old Holocaust survivor who now lives in Danville was recognized by the state government earlier this month as part of National Holocaust Remembrance Day and Week. 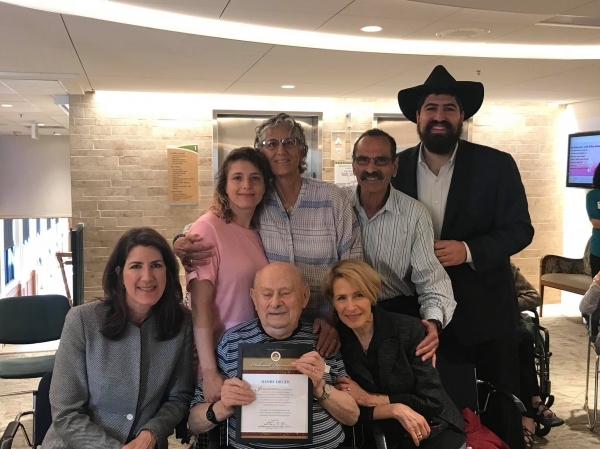 Tri-Valley Assemblywoman Catharine Baker (R-San Ramon) met with Polish-born Holocaust survivor Henry Drejer and his family at his home in The Reutlinger senior living community Monday morning to present him with a plaque recognizing his life. The ceremony calls attention to the atrocities committed during the Holocaust and honors the bravery and fortitude of the victims, survivors and liberators who experienced it first-hand. Drejer came from an Orthodox home in Poland where he sang in his synagogue’s choir — having an early talent, he sang solo pieces at the age of 6. After the Nazi invasion in 1939, German soldiers began shipping every able-bodied Jew from Drejer’s hometown of Slupca, located just outside the capitol of Warsaw, to work camps. “From 1940 until 1945, I was in several concentration camps, and I went through hell. The reason why I survived was because I worked as a tailor, I was very very very very lucky,” Drejer said in a recorded oral history interview, published in 1989. In 1941, Drejer was sent by cattle train to a stone quarry concentration camp called Kraków-Płaszów, when he was only 15 years old. There he worked in a tailor shop, saving him from the hard labor in the stone quarry. “My mama saved my life because she told me I had to learn a profession,” said Drejer, who had been training to become a tailor prior to the war’s outbreak. While in the concentration camps, Drejer, who would become a cantor later in life, sang to keep the spirits of his friends up. At one point in the camps, his singing even saved his life. Drejer said that during a period in one camp, the Nazi soldiers in charge had decided they would kill 5,000 people a day there. While singing for his fellow prisoners, German soldiers walked up and said they had not met their daily quota. The soldiers told Drejer to continue to sing while they killed the men around him. “They would pull him out and make him sing while they killed all around him,” Drejer’s stepdaughter Elisheva Gur-Arieh said. Drejer was 19 when American forces liberated his camp at Mauthausen, one of the last concentration camps to be liberated by Allied forces. He said he weighed only 60 pounds and couldn’t walk. “People got wild and crazy. They were so excited, they were overwhelmed and they kissed those soldiers and they kissed the tanks … there are not enough words to tell you about it, this was something unbelievable,” he said. “I came out of the concentration camps with no family, everybody was dead, everybody was dead, I had nobody left,” he added. Drejer spent a year in a displacement camp in Austria after liberation, where he acted as a leader for the survivors. Because he spoke German, in addition to Yiddish and Polish, he was able to communicate with locals as well as soldiers. This enabled him to gather large amounts of food tickets, which he used to buy whatever his people needed. In 1948 he immigrated to New Orleans and moved to San Francisco three months later. He became a U.S. citizen in 1955. While in San Francisco, he became the official cantor at his synagogue B’nai Emunah (children of faith), which was formally established in 1949. Most of the founding members are refugees from Nazism and survivors of the Holocaust. “He’s a hero because he survived the unspeakable. In order to survive the unspeakable you have to have a certain state of mind and character, and Henry had that,” Gur-Arieh said. Holocaust Remembrance Day and Week have been commemorated at the State Capitol for the past 16 years. The Assembly’s Holocaust Remembrance ceremony honors Holocaust survivors, liberators and children of survivors, while also remembering the over 6 million Jews who died there. A recent survey by The Conference on Jewish Material Claims Against Germany found that 22% of millennials have never heard, or are not sure if they have heard, about the Holocaust. The same study found that almost half (49%) of millennials cannot name one of the over 40,000 concentration camps that were established across Europe. At the ceremony, Drejer shared his story with his family and community members, but did not want the past to take away from his enjoyment of life. “I could tell you a lot more but I would like to do more singing and more entertaining,” said the 94-year-old, choosing to sing with his children, granddaughter and friends afterward. To learn more about Drejer and the Holocaust, visit the United States Holocaust Memorial Museum online.